As I explained in another post: I can’t get Reaper to open up Addicitve with 18 outputs to separate tracks. I want to solve this obviously, but it’s not a huge problem, because Addictive is quite capable in producing a good sounding drum mix with just the stereo outs. I was just wondering if you all export your audio to separate tracks, or if anyone choses to use the stereo out option (and why)? Is it because you prefer to use other software to equalise, compress, distort, delay etc. or is it more a question of having all the drum parts at your mixing fingertips (or both)? Why can’t you get reaper to open it up with 18 outputs? I use addictive in that way. I can send you a template of the way I have it set up if you’d like. page 33 in the manual. Yep, I know that part of the equation. I’m just not sure how to setup the 18 Reaper tracks and how to connect those to the channels. It should be easy, but for some reason I couldn’t make the connection. I guess I should look it up in the Reaper manual before asking you guys… I just never seem to find what I need in that huge manual. Here’s my Addictive Drums multi out template. It will probably be different from your workflow, but you can at least get the basic idea of how you can set up multi outputs from AD. I didn’t remove any of the plugins that I have in the template so those will probably just show up blank for you, but the routing should work. Thanks a lot Boz! It should get me up and running and I’ll just tweak from there. I’ve been using AD and AD2 in Mixcraft for years and never had this issue… when setting the options as Boz showed, I get the full set of 18 outs. There is also a global option setting in the AD2 options (not at the music rig so can’t be more specific just now) that you set as well. I was just wondering if you all export your audio to separate tracks, or if anyone choses to use the stereo out option (and why)? Is it because you prefer to use other software to equalise, compress, distort, delay etc. or is it more a question of having all the drum parts at your mixing fingertips (or both)? Addictive is my go-to drum software. Everything else - Stereo out. I think its pretty easy to balance the toms, overheads, room and ambience mics and mash them up. To answer your question, I use the multi-out for a number of different reasons. First is automation - and its very important to me. Juicing the kick on a chorus, or pushing overhead faders through 2 bar buildup, or making a cymbal hit sound huge by giving it a volume hike for one hit, are all examples of when you would automate drums. Though its possible, it is a headache to automate things that are not on bus sends. The second reason processing. AD’s envelope and pitch shifting algorithms are great. Their compression is acceptable. But I find their EQ and saturation are very difficult to work with. The problems is you often need saturation and EQ at the front of your chain. So as the snare hits, it goes though an aux channel and triggers two other drum triggers every time they hit. Three different snares provide three different sources of information, then you blend them together. So I might have a wooden DW as my primary snare. There’s a piccolo I really like for top in Addictive Trigger. There’s a big fat deep bottom snare I really like in Slate Trigger. Doing it this way, I get all 3 at once. Then they go here. (All snares) - Pro Tools aux/bus. Candid comment: when I manually add EZ drummer to a track, I have to manually set its outputs to feed individual tracks. But when I select “virtual instrument on new track” from the “Insert” menu, Reaper does this automatically for me. Doesn’t it work the same with AD? And about the initial question: I do use EZ drummer in stereo mode sometimes. I find that it is very easy to over process sampled drum sounds (versus a real, unprocessed kit recording), and using a stereo drums bus is one way to keep from overdoing it. Besides, there are a number of good options inside EZ drummer to get the drums to sound as you want them in the first place, which also makes mixing more simple/fast by having less tracks and less plugins to handle. I don’t remember the dialogue box. But try this: add the Addictive Drums 18 out as the effect. 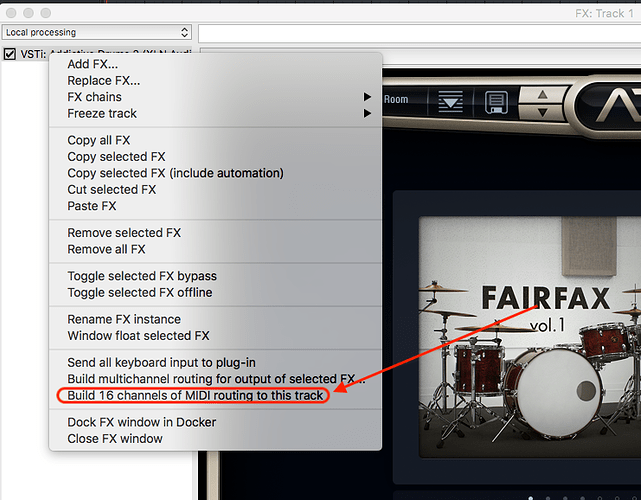 Then from the track FX window, R-click on Addictive Drums and select Build 16 channels of MIDI routing to this track. That’s only 16 channels, of course. But after you add 17 and 18, just save it as a template. Then in the future, just R-click the track and load the template for those tracks and FX. Ah thanks Tesgin, this is what I was looking for! For some reason I never tried right clicking in the Fx box. Reaper has endless possibilities, but you sometimes get lost even though an easy solution is right at hand. Oh and by the way, I found out your solution was almost the right one, but not quite. 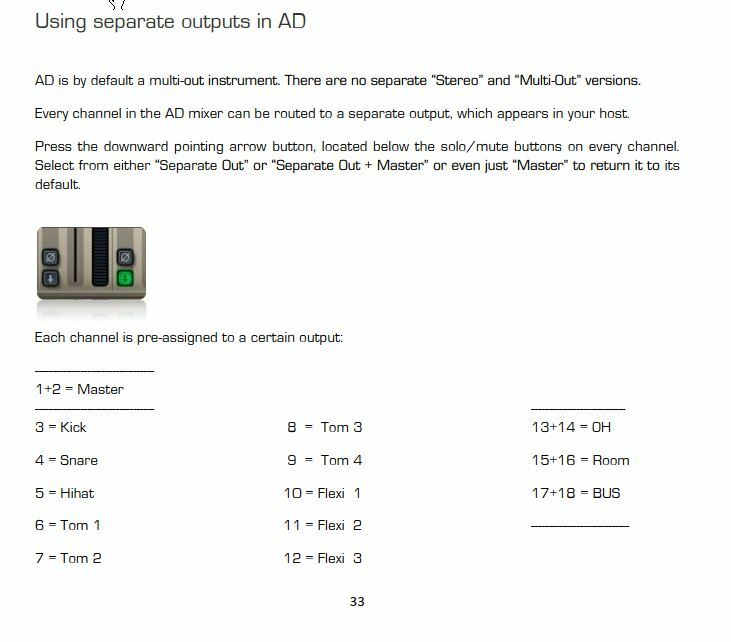 Just above the “build 16 channels of midi routing to this track” is a better option: “build multichannel routing for outputs of selected effects” . That one does the trick in one go. You’re giving me ideas! I don’t really need to process the toms and such. I’ll have to try your triggering trick some time. Being a bit of a drummer myself: I’m a cymbals guy, and I like to have more control over them including automation of the ride for instance. I suppose the way to go is to copy the midi pattern (only the ride in this case) to a separate track and trigger a cymbal. I can’t see myself using three more samples for the snare. I already find the possibilities that AD II offers overwhelming with 3 adpacks to choose from. This is also useful to know. I guess you want to use the best (in terms of flavours of compression/ distortion/ harmonics etc.) compressors and saturation you have, and I know I have one or two plugins that sound better than the stock from AD. So you don’t use any e.q., compression or saturation from AD on the overheads and room mics? I guess you use your other plugins on the stereo out? I’ve read that there are some differences between the big names in drum programs on this front. Some are more processed form the start, and I have heard that comment about EZ drums. So I can understand your comment about taking it easy on the processing side! I suppose that makes life easier in one sense (you don’t need to do as much work and simply choose for the stereo outs), but I like the option of using more natural sounding drums sometimes. I’ve read that there are better options than Addictive for this purpose, can’t remember which, but AD is good enough for me. I suppose the way to go is to copy the midi pattern (only the ride in this case) to a separate track and trigger a cymbal. I wouldn’t do that. Remember that Addictive isn’t the most phase friendly sample pack out there. The round-robins in the cymbals can develop weird artifacts when you layer them and copy/paste certain kit pieces. However, if you choose another ride sample on the duplicate track you’ll probably be ok. So you don’t use any e.q., compression or saturation from AD on the overheads and room mics? I guess you use your other plugins on the stereo out? I really don’t like the saturation. I do use the Hi-pass filter on the OH’s and room mics. As far as the compressor, the raw samples have an ungodly amount of tracking compression already applied. Its why they sound so much more production ready than BFD. But I like it… the tracking compression has never gotten in my way. Another thing I don’t use is the effects. But if you use a room and hall, I would use it sparingly and only add room to the room mics. Or room and hall to the room mics. A year ago I stopped adding reverb to a snare drums in my mixes. Chris Lord-Alge doesn’t do it either. His snares are always 100% dry. It took me a couple weeks to of studying to learn how on earth he makes that work. I probably went through 20 practice mixes before I had good enough control of mechanics, but when I got the technique under my belt, I feel like it took my drums mixes to a whole different level! …i’ve never put reverb on a snare drum since lol. Yep I get that. I have a set of cymbal samples which are quite good somewhere, never really got round to using them. Well, that’s an insight! And a long way from the iconic processing of John Bonham’s drums I guess. But I don’t want big boomy drums on everything, so I’ll have to try going the dry route. No delays either? I’m a little surprised you use AD rather than BFD. I understood the latter is better, so I would have guessed a pro like you would go for the best quality? Maybe more work to get it production ready as you imply. I’m a little surprised you use AD rather than BFD. I’ve never used BFD, but I do have superior drummer 2, and I’ve grown a pretty good appreciation for AD over the past couple of months. The UI took me a while to figure out, but once you know how to maneuver around, it’s easier to swap out different drums and stuff because all the sample are organized in a standardized way. SD doesn’t do well with mixing kits, which is a shame. Well, that’s an insight! And a long way from the iconic processing of John Bonham’s drums I guess. But I don’t want big boomy drums on everything, so I’ll have to try going the dry route. Ok. So I should clarify. The technique is really about getting super forward, hard hitting, and punchy drums. Either that or ultra clean sensitive detailed drums for stuff like Jazz. The no-verb rule is unique to his sound, but of course he was free to break that rule whenever necessary. I’ve never had a producer fight me on it - but if they insisted I’d make it work of course. Hmmm. I can’t remember. I don’t recall ever seeing him use delay on a snare. By large the processing on his snares (and we’re talking the direct mic) usually stops at the parallel processing level. But what I’ve seen him do on stuff like MTWM videos is only a fraction of what he does on a day-to-day basis. lol…haha thanks. Hmmm. I wouldn’t say BFD is better. I’d say that Addictive samples are recorded in a way that makes the sound wider, wetter, and more open. I have NO idea how this was done in the studio they recorded at. However this wide/wet/open sound can really hurt you because once all that processing has been committed to the sample, you can’t dial it back. As I told Tesgin in the thread on his song, my Additive templates start with all the effects stripped off, but you can’t strip the effects off that were committed to the sample. BFD has the most organic drums I’ve ever heard, with exquisite attention to articulations and detail. But the samples are so raw that sometimes it takes more time to sculpt them into the track. Even then, sometimes you don’t get what you need, and you have to take it apart and start all over using Addictive instead. BFD also, by far, have the widest and most diverse library you can find. Addictive’s expansion options for anything like orchestral drums, latin percussion, asian, Indian, drum libraries are pretty basic, but for most people this is a total ‘so what’. I found out your solution was almost the right one, but not quite. Just above the “build 16 channels of midi routing to this track” is a better option: “build multichannel routing for outputs of selected effects” . That one does the trick in one go. Hah! I missed that. I never use more than 16. Nice.